This is installment eight of a 12-part series on grasses. Read the previous installment here. Life gets busy sometimes, and blog posts can seem a frivolous indulgence. But then things don’t match up right, and one feels further behind* than she should for not having gotten the semaphore grass (Pleuropogon) post out in time for International Talk Like a Pirate Day on September 19. “Why should that matter?” you might think (that, or, “You totally lost me”). Well, the genus name for this grass translates from the Greek as “Sidebeard” and I think that would make an excellent pirate name. Like pirates, semaphore grasses are usually found near water; also, there are a lot fewer than there used to be. 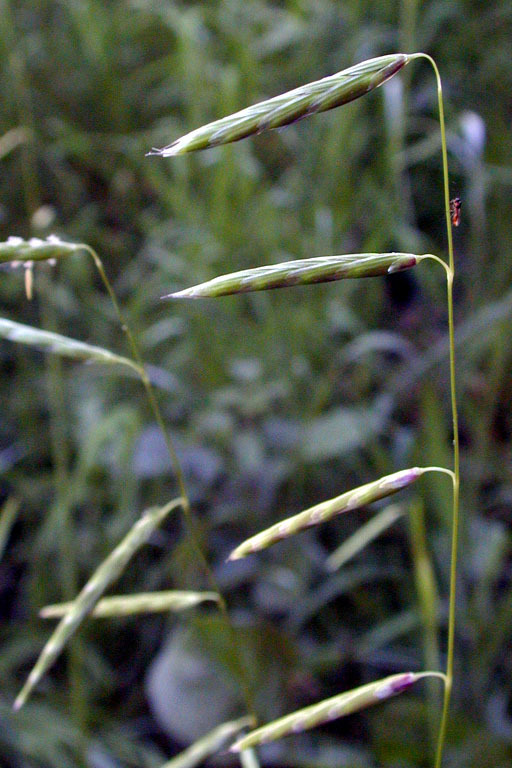 Marin County has two rare species, nodding (P. refractus) and North Coast (P. hooverianus), and the more common California (P. californicus) semaphore grass. Nodding semaphore grass has only been found in Marin on the Point Reyes peninsula, although suitable redwood riparian habitat exists for it elsewhere in the county, and it is relatively common in Humboldt and Del Norte counties. 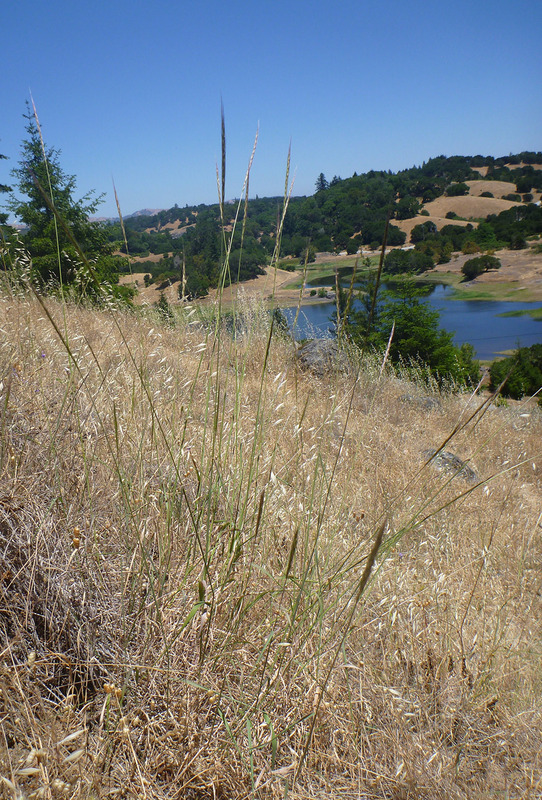 North Coast semaphore grass, state-listed as threatened, was once known from Ross, Lagunitas Meadows, and several spots along San Geronimo Creek; now, there is only one shrinking patch near the San Geronimo Treatment Plant. Sadly, most of Lagunitas Meadows was flooded when Bon Tempe Reservoir was built, and searches of that area have yielded no plants, so that population appears to have gone to its watery grave. California semaphore grass was also known from Ross, but can still be found in grassy wet meadows to the north and east in places such as Mt. Burdell and Hicks Valley. Semaphore grasses’ distinctive arrangement of their spikelets led to their common name: The flowering stalk stands like a mast with the small flagging spikelets waving in the breeze. The three species we have can be told apart by how their flags are held—the semaphore’s message is up=californicus, out=hooverianus, down= refractus. Other differences help in telling these apart as well (since the flags can sometimes give mixed messages), such as habitat, and the rare species’ rhizomatous habit. But if you encounter a Sidebeard of any kind, thank yer lucky stars! *At least I can translate the month and feel like I am still on track, since October (as I write this) is the “eighth” month. This is installment seven of a 12-part series on grasses. Read the previous installment here. Serpentine reedgrass (Calamagrostis ophitidis) is rare. We have tons of it. Such seemingly incongruous statements happen quite a bit on Mt. Tam, through the magic of the “Matrix of Rarity.” It depends on the scale at which you look. The California Native Plant Society (CNPS), which reviews the distribution of and threats to California’s flora, keeps an inventory of plants and the degree of rarity they display. So statewide (and worldwide), there may be fewer than 100,000 individuals, but if all those individuals are in a three-square-mile area they may seem abundant in that spot. Broadly distributed Common species, e.g. purple needlegrass (Stipa pulchra) Often rare, e.g. semaphore grass (Pleuropogon)—next month’s topic! Almost half of our rare plants are restricted to serpentine soils; like wetlands and beaches, these habitat types are finite. Often, rare plants in these spots will be quite common and you may wonder why they’re considered rare at all. Mt. Tam manzanita is actually so common it’s the dominant plant over most of our serpentine soils. Serpentine reedgrass is pickier still, preferring to grow at the edge and in the interstices of serpentine chaparral. Unlike Mt. Tam manzanita, though, serpentine reedgrass can be found outside Marin in Sonoma, Mendocino, Napa, and Lake counties, although we do have the bulk of it. This handsome perennial grass raises fluffy, open spikes one to three feet above clumps of deep green upright leaves. Some of the finest serpentine reedgrass grassland—a rare vegetation type—can be found along Pine Mountain Road opposite Azalea Hill. Another factor feeding into a plant’s status is the threat to its populations. 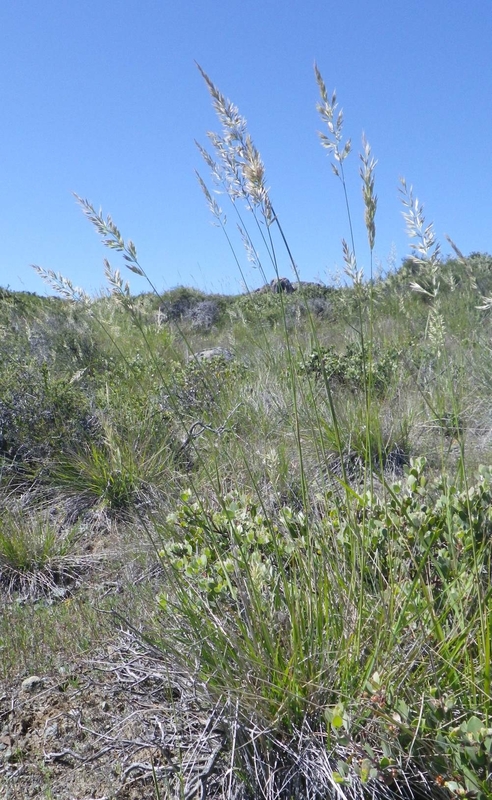 Serpentine reedgrass populations on Mt. Tamlapais are pretty stable: No one is bulldozing populations to build things, they don’t need fire to germinate, their habitat isn’t being taken over, no diseases are wiping them out. But in other counties that may not be the case. Like with the drought, we need to consider ourselves lucky that we are where we are and have what we have (90% of average water storage and 40 rare plant species), and continue to conserve. Central and northern Italy’s flora was amazing. The dense, lush vegetation filled every inch that didn’t have a structure or wasn’t cultivated for crops (primarily grapes and olive trees in the Tuscan region). The narrow, twisting, hilly roads in Greve guided us through forests thick with brambles, vines, and wildflowers. 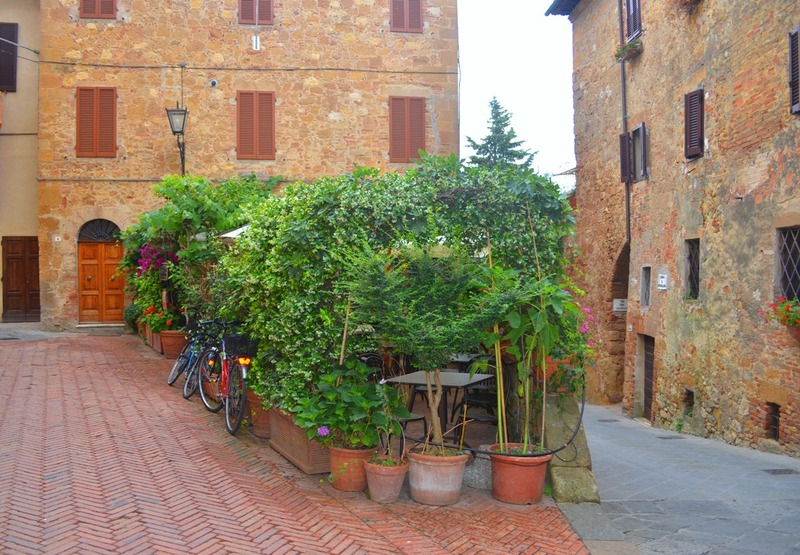 Each turn in the road surprised us with charming, tiny villages as we made our way to the Autostrada that paved the way to the ancient walled cities of Tuscany. For several days, San Gimignano, Siena, Montepulciano, Pienza, Montalcino, Monteriggioni, and Lucca found my daughter Lynette, her husband Jeff, and my son Randy coaxing me up the steep roads, and what seemed like thousands of steps, to reach the heart and plazas of these walled medieval towns. All the Stair Masters of the world could not have prepared me for this grueling exercise! Though my calves were screaming, the desire to explore drove me on to find the artifacts and ancient art I had read about. In every plaza we found a well covered with a metal grate. 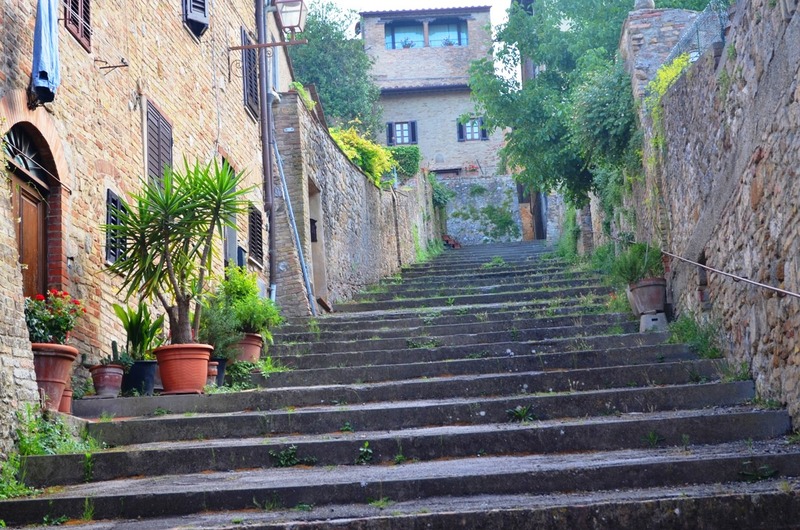 The steps leading up to each well provided seating for the weary tourist. What I didn’t expect was the abundance of window boxes crammed with color that brightened up the ancient structures from the 12th and 13th centuries. 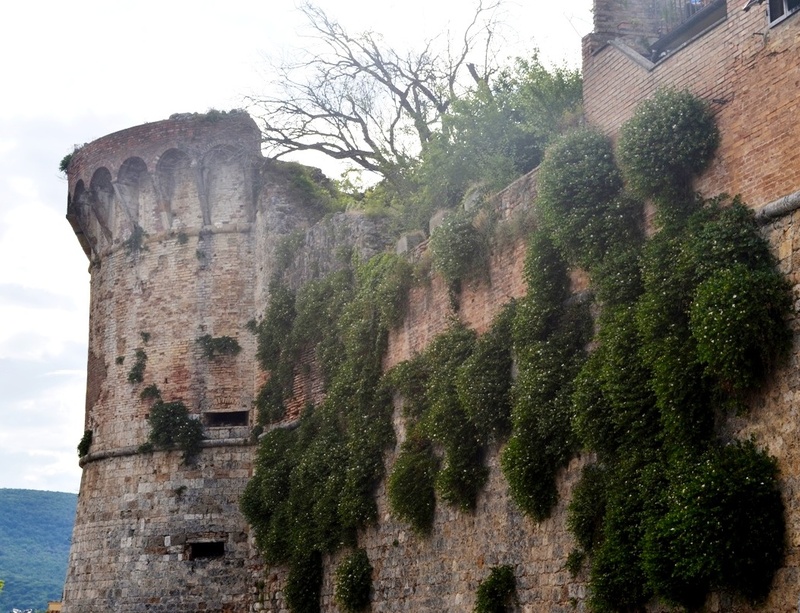 Within these ancient cities, all the vegetation was in containers. Repeatedly, star jasmine seemed to be the “star” as its scent filled the air. Despite the size of the plants, I was impressed that all flourished so well in containers. One restaurant even created an outdoor covered arbor using containers of grape vines and, you guessed it, star jasmine to provide shade for the diners underneath. The stone walls of the cities sprouted beautiful foliage that accented the patterns formed by stone masons of yesteryear. The fortress walls angled back toward the center of the town. Even though the stone collected the heat from the summer sun, rain could easily find its way into the crevices to irrigate the tenacious plants. And rain it did! While in Pienza, Randy and I ducked into the Palazzo Piccolomini, the former papal palace, to find an open roof that allowed rain to collect in the marble-covered room below. Indoor plants of all types prospered in this wealthy environment. 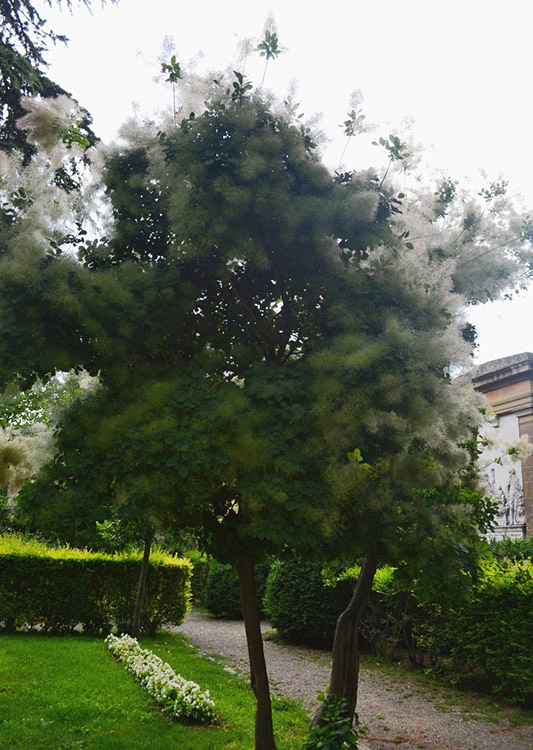 Upon our return to the car, we entered a beautiful park where familiar Cotinus coggygria (smoketree) was in full bloom, but sporting white panicles instead of the familiar smokey, pinkish-purple that I know. At that point, the sky opened up and we were grateful for the canopy of trees in the park acting as a giant umbrella for these ill-prepared tourists! If conditions are right, plants will thrive. This knowledge was driven home to me over and over again as I witnessed the beauty around me abounding in containers, crevices, and other harsh conditions. It drove home the point of planting native for maximum effectiveness. Year-round rain in Tuscany may increase gardening options without the need of irrigation, but the same principle still applies here at home. Our partners Marin Master Gardeners will be at the Marin County Fair today through Sunday with lots of great advice and resources for gardening in a drought. Drop by the “Potting Shed” to learn about designing low-water-use landscapes, water-wise edible gardening, and much more! Check out the schedule of activities. The fair is open daily 11 a.m. – 11 p.m., July 2 – 6, at the county fairgrounds at 10 Avenue of the Flags in San Rafael. Can’t make it to the fair? Marin Master Gardeners will come to you! Sign up for a Marin-Friendly Garden Walk at your home and get personalized, water-wise tips for a beautiful, healthy landscape. Watch the video below to learn more about the walks, then call 415-473-4204 to schedule your free appointment. As I looked around my garden this past weekend, I felt myself sigh in both satisfaction and a little relief. No doubt summertime is here and the plants in my north-facing garden are enjoying the warmer weather and longer days as much as I am! 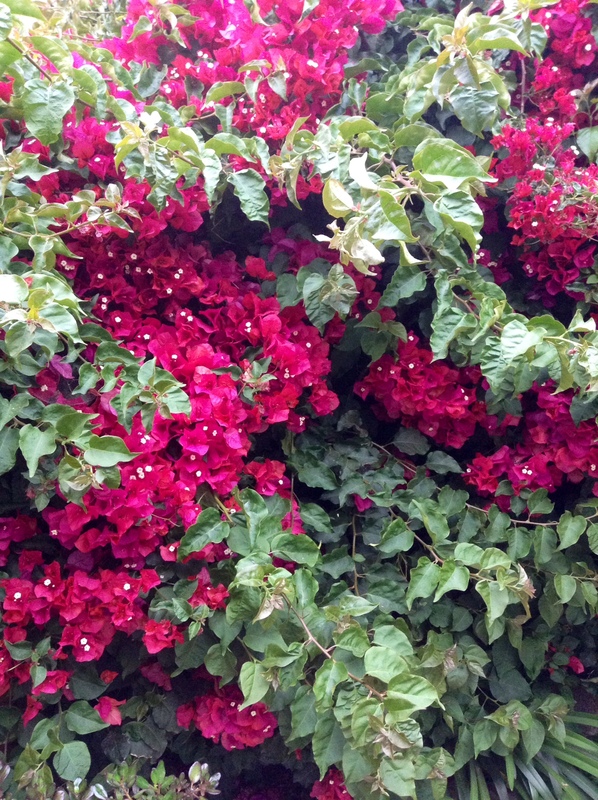 The star jasmine that turn pitifully bare every winter have resurrected themselves once again, and my bougainvillea is back and bigger than ever, spilling its maroon blossoms wildly over my neighbor’s fence. As a beginning gardener, this has been my most productive spring yet. In contrast to previous years, almost all of the projects I’ve been working on have yielded good results. 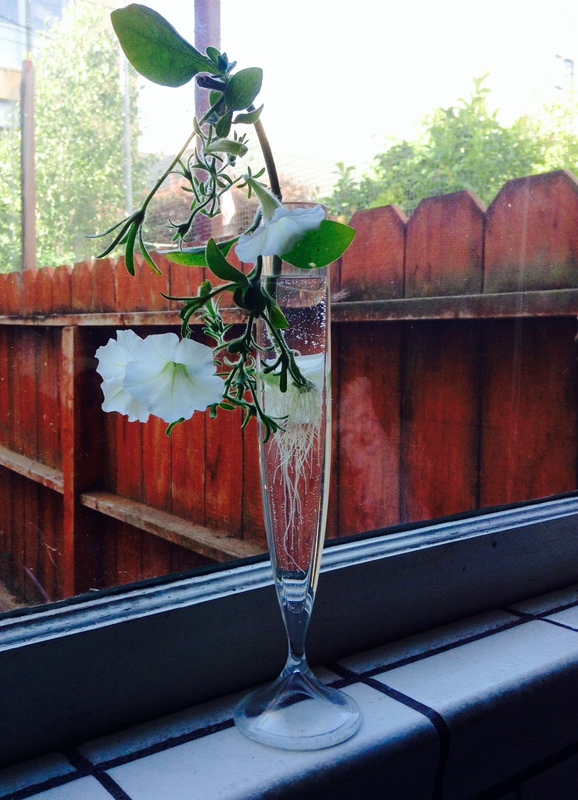 I’ve been successfully coaxing two morning glories up a trellis, patiently shaping a small collection of rosemary topiaries, and the petunias I received for my birthday in April are still alive and thriving in the intensifying sun. Surprisingly even the poppy seeds I scattered at the end of May have sprouted and grown! Maybe it’s safe to say that I’ve finally gotten a handle on how things grow, and it’s likely that working in water conservation has helped. But, as far as I’ve come, I do often find myself still grappling with some of the most basic of gardening concepts. One that I struggled with recently? Roots! What’s so complicated about roots, you ask? Well, let me start by saying that if you’re well-versed in water-wise gardening, you’re surely familiar with the principle of watering deeply, but infrequently to encourage more drought-tolerant plants. If you haven’t heard this before, watering in this manner can create plants with roots that grow more deeply. Not only can plants with deeper, more extensive root systems find water and nutrients in more places, but having roots further away from the surface of the soil means they also stay moist longer and plants don’t dry out as quickly. It was this concept that got me thinking. How deep is “deeply,” exactly? Of course, watering my potted plants has always been easy; I simply water until it comes out the bottom (fool-proof!). But, as I graduated from the simplicities of planter gardening, I began wondering about the tall shrubs that run around the perimeter of my yard. How deep are their roots? And what about trees? Is it both possible and necessary to water their entire roots zones? Well, what I have found is that plants and trees have portions of their root systems that can, in fact, grow very deep in the soil. You may remember Charlene mentioning in a previous post that some California annuals have roots that reach 20 feet! These deeper roots can serve as structural supports and to find water and nutrients in extreme conditions. Oak trees growing naturally on our watershed, and throughout Marin, typically have taproots that grow deeply for this reason. However, I was surprised to find out that the vast majority of a plant’s root system is concentrated much closer to the surface than I originally thought. Roughly 80% of a tree’s roots, for example, are concentrated in the top 12 to 36 inches of soil. Quite amazing when you think of how tall trees can get! Roots are confined to this depth, for the most part, because this is where the most oxygen, minerals, and nutrients are readily available. These elements become less and less prevalent as depth increases, and thus roots do, too. Not surprisingly then, watering beyond a depth of 36 inches essentially wastes water and effort. A great take-away tip that I found from the California Master Gardener Handbook, and one that I now use for hand watering, is the 1-2-3 rule. Water to a depth of one foot for small plants (like annuals and groundcovers), two feet for medium sized plants, and three feet for large shrubs and trees. How long it will take to reach this depth will vary depending on your soil type and the flow of your hose, so some initial experimentation is necessary. A day or so after watering, use a soil probe or a shovel to dig down and to see how far the water has traveled, then adjust accordingly. Consider using this same procedure to check that your irrigation runtimes are sufficient as well. With this small token of wisdom comes another sigh of relief. So far, gardening has surely been a process for me. It’s been a piecemeal operation with successes, frustrations, a lot of listening to those wiser than me, and most importantly, enjoyment. Last December, I bought and moved into my first house (my first house!). When I moved, I brought with me a large assortment of container plantings I’d accumulated over the past dozen years or so—pineapple sage, ferns, agastache, salvia, fuchsia, honeysuckle, penstemon, bee balm, and various succulents. Now that I was in my own home and had a “real” yard to work with, I was eager to get my collection of potted plants into the ground where they belonged. But it was mid-winter, I had a seemingly never-ending list of DIY projects inside the house to keep me occupied (which, amazingly, continues to grow), and I knew the plants would be fine until I could find the time to give them a permanent in-ground home. A few months later, just as I was starting to think about digging planting holes and getting the garden in order, a co-worker forwarded me a link to the Save Our Water website. Of particular interest to me was the section “Water-Wise Landscaping Basics,” which provides information on things to keep in mind when creating or maintaining a low water-use landscape. Even though I felt like I had a pretty good handle on water-wise gardening (based on almost 20 years working in water conservation), I found reviewing the site’s list of simple basic principles to be an excellent refresher. It’s easy to overlook the importance of mulch in reducing water use in the garden or to forget to adjust the irrigation schedule as often as one should. However, considering the record low rainfall we received last year, and the annual uncertainty of what future rain may fall, it’s a good idea for each of us to look at what we’re doing in our own gardens and make sure we’re following the basic framework of water-wise gardening. Appropriate plant selection: Select trees, shrubs, and groundcovers based on their adaptability to your region’s soil and climate. The right plants for the right soil: Knowing your soil and selecting the right kind of plants for your area is an important part of a water-wise landscape. Limit your grass: Consider cutting back or eliminating the amount of turf you have at your house. Efficient irrigation: The greatest waste of outdoor water is applying too much too often. Mulch is good: Use mulch wherever possible. Mulch conserves water by significantly reducing moisture evaporation from the soil, reduces weed populations, prevents soil compaction, and moderates soil temperatures. Appropriate maintenance: A well-designed landscape can decrease maintenance by as much as 50% through reduced mowing, once-a-year mulching, elimination of non-California-friendly plants, and more efficient watering techniques. This is installment five of a 12-part series on grasses. Read the previous installment here. I know I should like American robins, but I don’t. It’s just that they’re so common. And I kind of feel that way about blue wildrye (Elymus glaucus). I first learned blue wildrye in Oregon, during those formative summers on a coastal grassland overlooking the mouth of the Salmon River. Being new to grass ID, I really appreciated how obvious it was—four-to-six-foot-tall spires in a foot-wide clump, usually a bluish-green color with short upper blades flagged straight out from the stem. The inflorescence was nice and simple, too, a narrow, bristled spike. No branching, or sterile florets, or measuring or counting veins to worry about. Just blue wildrye, plain and simple. And then I started monitoring grasslands, and I was so over blue wildrye. Because it was everywhere. So common. And easy to collect, and easy to grow. Just bend the flowering stalks into a bag and “milk” the seeds and the ripe ones slide right out. Then scatter the seeds over a site and next growing season it will be lousy with wildrye. And these are all good things. Like robins. Sharp red breast, jaunty hop, cherry-dew song. But they’re everywhere. So common. And so it is sometimes: The need for the new, the value we give to rarity overshadows the basic merits of a thing. I just have to remind myself to appreciate and celebrate the common, to see with new eyes instead of wanting my eyes to always see the new.